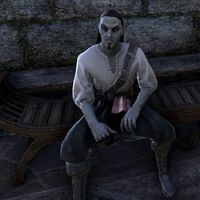 Trilam Rindo is a Dunmer treasure hunter in Vivec City. He can be found on the east side of the Canton of St. Olms the Just. He's sitting on a bench on the lower terrace. "Do not look upon me, stranger, for I am surely cursed. Greed blinded me, and innocent lives have suffered. Yet I was spared. Perhaps this unending guilt is meant to be my punishment." "We found a relic deep in the Ashlands, near Kogoruhn, and sold it to a Temple historian here in Vivec. Now he lies dead and his young assistant is on the run, wanted for murder. Such a sweet girl. What if the relic … made her do that?" You think the relic you found caused her to kill someone? "It's just a feeling. That relic had a … I don't know, a draw to it. Like it wanted me to bring it here. It sounds crazy, but her brother sought me out. " "He seemed convinced it was the cause and where it came from was key to where she was heading." "The Ashlands are dangerous, but around Kogoruhn … there's something off. Don't find yourself cursed as well." Can you tell me anything else about the siblings? "His name was Tythis—an Ordinator—real intense, but I could tell it was concern for his sister: Nevena. She was young, enthusiastic, honored to be at the Temple … poor girl. If you find them, I hope you undo the harm I've caused." "It was the home of a Great House that fell into ruin. Red Mountain has buried most of it, but the bones are there if you know what to look for. To be honest, I just sort of stumbled on the statue in the wasteland. Lucky find … I thought." Tell me about the statue you found. "It was an ugly thing, sinister even, but I knew the Temple would be interested. There aren't many pieces that survived that dark time, and they wouldn't want something like that circulating around. I swear, I thought it would be safe with them." This page was last modified on 23 March 2019, at 23:43.